August 1813: Austria ends its neutrality and enters the VIth Coalition against France. After joining contingents of the Russian and Prussian armies, this new army marches north out of Bohemia nearly two hundred thousand strong. They march along the west bank of the Elbe into Saxony, this army's large lumbering columns stretched across the Erz mountains. From where he has been pursuing enemy forces to the east, Napoleon sees this new threat aimed at his line of communications and the city of Dresden, the main supply depot for his army. Only a single French Corps stands in its way. Outnumbered nearly ten-to-one, it cannot hold. In a flurry of orders, Napoleon redirects his guard and several corps to march to its rescue. 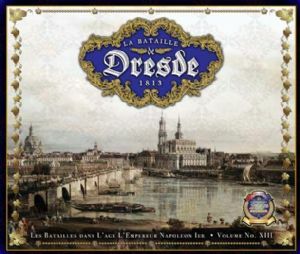 La Bataille de Dresde details the titanic battle that ensued on August 25th and raged through the 27th. Up to four players control the Prussian, Austrian and Russian forces commanded by Feldmarschall Carl zu Schwarzenberg, while up to a further four command such French personages as Marshals Ney, Marmont, Mortier, Victor, St. Cyr, or Napoleon himself. Every battalion of infantry, squadron of cavalry or battery of artillery that was present at the battle is included...and are at the players' command.